Codium fragile subsp. capense P.C. Silva 1959: 153-157. Thallus dark green, erect, 10-30 cm tall, dichotomously branched up to 10 x or more, branches terete throughout or slightly flattened near base of thallus, 5-8 (-14) mm in diameter, tapering at apices. Utricles club-shaped, 730-1100 µm long, 130-270 (-355) µm wide, apices characteristically pointed, with a sharp mucro. Hairs or hair-scars common, 1-2 (-3) per utricle, borne short distance below apex. Gametangia lanceolate-ovoid to cylindrical, 275-460 µm long, borne on pedicels in zone near middle of utricle. Orange River to Tsitsikamma (1-32). Found in lower eulittoral zone and rock pools. A southern African endemic, also found in Namibia (but see note). The species C. fragile is found in northern and southern hemisphere temperate seas: many records appear to be recent introductions. Type locality: Melkbosch, Western Cape (Silva et al. 1996). Note: recent molecular studies (Provan et al. 2008, Verbruggen et al. 2016, Armitage et al. 2017) raise taxonomic questions about entities within C. fragile. 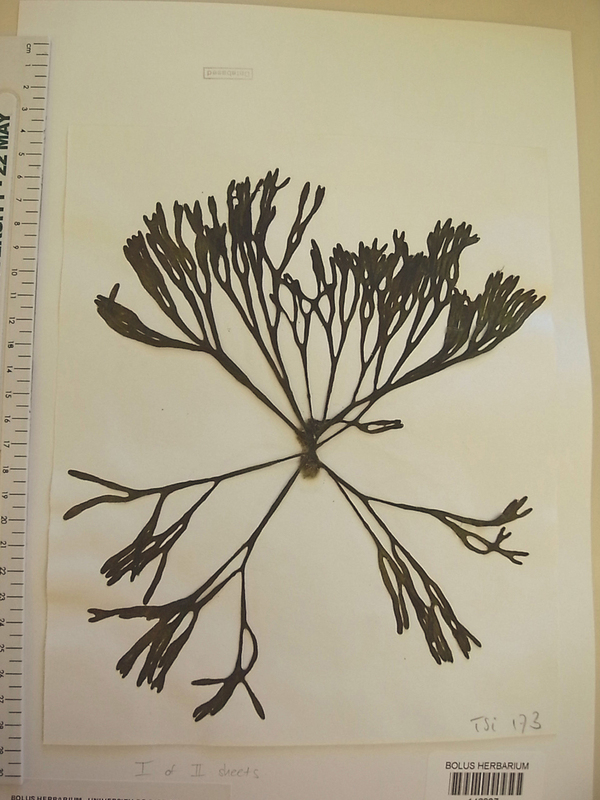 Codium fragile subsp capense, herbarium specimen. Codium fragile subsp capense, detail of utricles with characteristic sharp points (mucros). 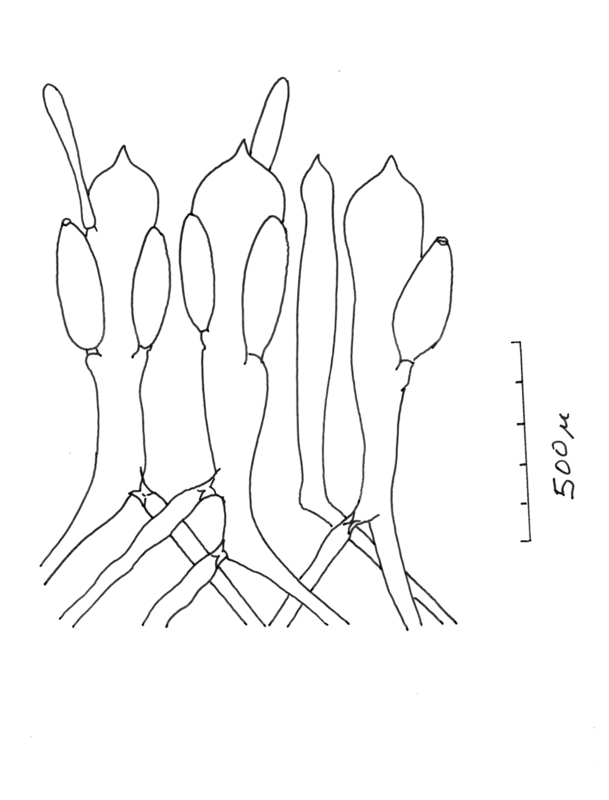 Re-drawn after Silva (1959). Provan, J., Booth, D., Todd, N.P., Beatty, G.E. & Maggs C.A. 2008. Tracking biological invasions in space and time: elucidating the invasive history of the green alga Codium fragile using old DNA. Diversity and Distributions 14: 343-354. Verbruggen, H., Brookes, M.J.L, & J.F. Costa (2016). 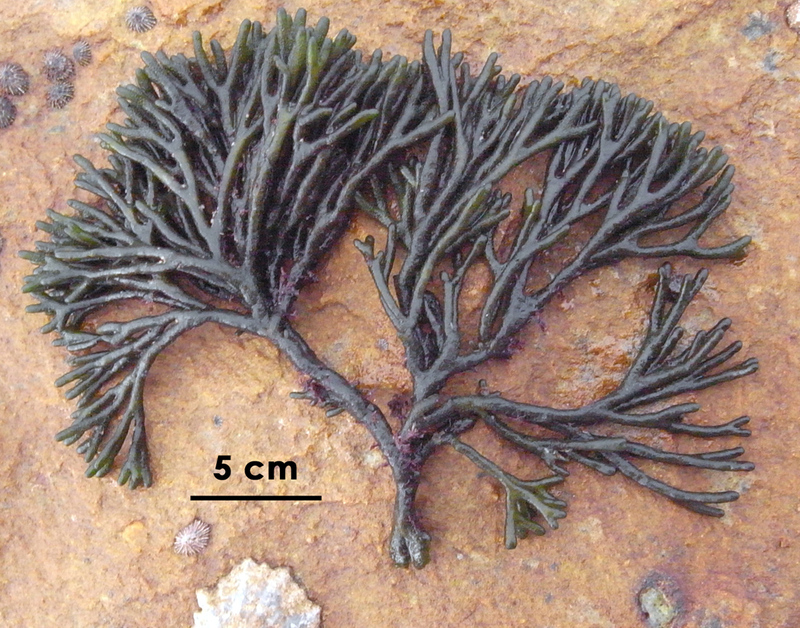 DNA barcodes and morphometric data indicate that Codium fragile (Bryopsidales, Chlorophyta) may consist of two species. Phycologia 56 (1): 54-62.